Two unmanned spacecraft began mapping the moon's gravity field Tuesday (March 6) as part of a NASA mission to probe the structure and evolution of Earth's nearest neighbor. NASA's twin Grail (Gravity Recovery And Interior Laboratory) spacecraft started collecting science data Tuesday and will spend 84 days studying the lunar gravitational field in unprecedented detail. Astronomers hope the mission will help them better understand how the the moon — and other rocky bodies in the solar system — formed and evolved. "The initiation of science data collection is a time when the team lets out a collective sigh of relief because we are finally doing what we came to do," Maria Zuber, principal investigator for the Grail mission at the Massachusetts Institute of Technology, said in a statement. "But it is also a time where we have to put the coffee pot on, roll up our sleeves and get to work." 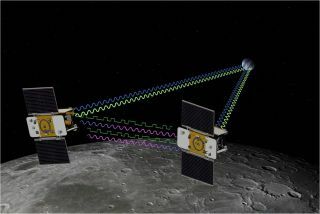 The $496 million Grail mission launched in September 2011, and the two spacecraft, named Ebb and Flow, entered lunar orbit on New Year's Eve and New Years Day, respectively. Each lunar orbiter is about the size of a washing machine. "During the science phase, our spacecraft will orbit the moon as high as 31 miles (51 kilometers) and as low as 10 miles (16 km)," said David Lehman, Grail project manager at NASA's Jet Propulsion Laboratory in Pasadena, Calif. "They will get as close to each other as 40 miles (65 km) and as far apart as 140 miles (225 km)." Science activities should wrap up on May 29, after Grail maps the moon's gravity field three times. Public outreach and education are a big part of the Grail mission. Each spacecraft is carrying four cameras and will snap photos of the lunar surface at the direction of middle-school students across the country. Students will get to pore over these pictures after they're beamed back down to Earth. The photo project — which is called MoonKam and is run by former NASA astronaut Sally Ride — has already generated lots of enthusiasm. Several thousand schools have signed up to participate, according to Zuber. The two spacecraft were initially named Grail-A and Grail-B, but NASA held a nationwide student contest to pick better monikers for the probes. Nearly 900 classrooms submitted entries, including a fourth-grade class at Emily Dickinson Elementary School in Bozeman, Mont., which proposed Ebb and Flow.